This week I am featuring one of the loveliest ladies on the internet- Ms. Kim-Anh! She is no stranger to this blog - check out her Tattoo Tuesday- and I'm so happy to have her back. Be sure to check out her blog and shop for some great posts and gorgeous art! My name is Kim-Anh Nguyen, I'm a Swiss girl from Vietnamese descent. I'm 22 years old and right now I'm working as a tattoo apprentice, since January 2011, at Inkvaders Tattoo (Carouge, Geneva, Switzerland. Before beginning my apprenticeship I had a blog where I posted some of my drawings and paintings. After some months of having the blog people started asking me for commissioned works, so most of my time was dedicated to drawing or painting. I don't have any formal studies in art... I succeeded at the admission tests for art school when I was 15 but my parents convinced me not to follow that path. So before having my blog and begin my tattoo apprenticeship I did some business related studies and worked a little bit for the city administration, but never felt happy doing that. If I don't have any tattoos scheduled I work on some paintings or tattoos projects for future customers. Thus said, some afternoons will only be about cleaning tubes! End of the afternoon: tattoo stations cleansing once the tattoo sessions are over and prepare the next day stuff as much as I can! Go to sleep at around 12am extremely tired... then, LOUD SNORING!!! Did you always want to be a tattoo artist? How did you get into this field? A Tattooer? Not really... thus said, I've always been into drawing and painting, since my childhood. I've always dreamed of an art related job. Then I began to get tattoos at around 15 y.o. and the idea (dream) of becoming a tattooist began to make its way on my head at around 18 y.o. It began to seem "logic" at some point as I was passionate by drawing and tattoos. Is this what you hope to do for the rest of your life? I hope to become a tattooer someday soon (in the next years) and be able to do it for a living. I really don't know about that "for the rest of my life" part, it's still too far away right now, but I surely want to do this for the next years to come! Well, I'm not so far away from the girl I was when I was 17 y.o. I'm still a lazy person a lot of times, procrastination is definitively in my blood... So, in a way, I'm still in that phase where I'm fighting against those bad habits... The main difference would be that I've become aware of it and I'm trying, as much as I can, to change for better. Love Kim-Anh! She's designed two of my tattoos. One that is on me, one that will be on me when I am no longer pregnant or breastfeeding. She's amazing and so very naturally talented. I love this new series!! Love reading about people's jobs. I've been following Kim-Anh's blog since I found it a while ago, I love her tattoo designs and hope to get some of here work one day. Thanks for featuring her Danielle, really cool post. What a lovely girl!! Her designs are brilliantly done! I am also loving this 9 to 5 series! This is a nice change to see a tattoo apprentice! I tell you, if i lived anywhere near Switzerland, I would definitely be going to her for a tattoo. 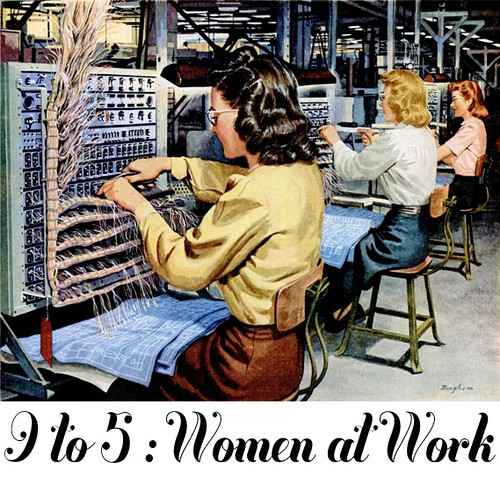 It's so nice to see females in this field of work. 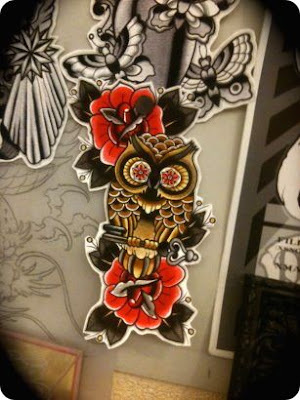 Oooh that owl with the red flowers was gorgeous!! What an awesome post! i love the owl! i think that this would be such a fun job! 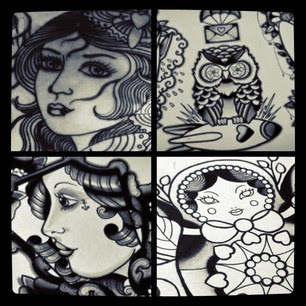 awesome feature, i love the old school designs and would love to get tattooed by her! I LOVE her work! I have been waiting to get a tattoo of the piece she designed for me. I just need to build the courage to make my appointment. Her work is amazing! Cool! That's pretty close to what my job is like, but no tattooing or painting, and more talking to tourists and answering phones. Her work is really beautiful, I love her attention to detail! Such lovely artwork,she's very talented! i love her art work!! super talented. let me know if you ever want to come to hawaii for a guest spot! If u like Bush or Gavin I have a picture of him up close. Love you and Sometimes Most of the Time Sweet ! I love, love, love your owl flash! All of your flash is gorgeous. I wish I could come to Switzerland for an appointment! that vase with the flowers!!! i must have this tattooed on me somewhere! Love how dainty yet strong her pieces are... I love your tattoo posts btw! Appoint setting is an arranged meeting between the two peoples. it can be a so useful to save a time for a big companies or firm they always like to meet every people via the arranged meetings. in this type of meeting we can know early the at what time when we have to go and who will meet us.